Like the GOM with Earl, hard hit Eastern China is also getting some good news this morning as Tropical Storm Megi is now forecast to veer away off the coast and into Korea and Japan as a smaller storm than initially forecast. The Storm should remain Category 1, so damage should be limited, but will bring much rain to already water-logged parts of the country causing flooding and land slides. With Typhoon Megi approaching the southern sea off Jeju Island on Wednesday, the Korean Peninsula would come under the influence of the typhoon, predicted the Korea Meteorological Administration (KMA) Tuesday. The name “Megi” was proposed by Korea. The KMA forecasted that the typhoon would go past the southern parts of Korea on Thursday and move out to the East Sea on Friday. Due to the typhoon, southern regions and Jeju will experience rainfall of 100 to 300 millimeters. As of Tuesday noon, Megi, a medium-size typhoon, is moving north-northwest from 24 kilometers south of Japan's Okinawa at a speed of 31 kilometers per hour. The KMA said, “The typhoon will not easily die out because it will continuously be provided with vapor due to high sea water temperatures (29 to 30 degrees Celsius) on the South Sea.” “It is recommended that people check facilities and manage their crops. Campers in valleys, riverside areas or beaches should frequently check weather forecasts to guarantee their safety,” the KMA said. Typhoon Megi hit southern parts of the peninsula Wednesday night, bringing heavy rains and strong winds, particularly to South Cholla Province and southern coastal areas. Airport officials said thirty-four flights from Seoul to cities in the southern regions were canceled due to the typhoon. Torrential rains pounded Cheju Island, inundating 22 households, forcing about 3,300 boats to stay in harbor and disrupting airplane flights. In Kwangju and South Cholla Province, downpours shut down train operations and forced hundreds of residents to evacuate their homes due to flash floods. According to the Korea Meteorological Administration (KMA), about 20-70 millimeters of rain per hour drenched southern regions of the nation. 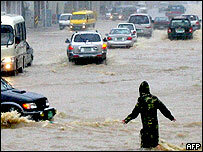 Seoul and cities in Kyonggi and Kangwon provinces saw about 10 mm of sporadic rain per hour, the KMA said. The weather agency said the typhoon is expected to detour toward the East Sea Thursday after hitting southern coastal areas of South Kyongsang Province. As of Wednesday afternoon, Songpanak on the southern resort island of Cheju had 211 mm of rain, Naju in South Cholla Province 420.5 mm, Pungam in Kwangju 378 mm, and Sanchong in South Kyongsang Province 296 mm. According to forecasts, heavy rain will continue to fall until Thursday. Some 100-400 mm of more rain is forecast for southern coastal regions and areas of Kangwon province. Chungchong Province is expected to have 50-100 mm of more rain and Seoul and Kyonggi Province 30-60 mm. The Korea Airports Corporation said 14 flights from Kimpo to Yosu in South Cholla Province were canceled after Yosu was severely affected by Megi. Heavy rains also grounded flights leaving Kimpo for Pohang, Sachon, Kwangju and Mokpo. Heavy rains partially paralyzed some rail lines linking Seoul with cities in South Cholla Province. The Korean National Railway (KORAIL) said train services for the Mokpo-Sunchon route have been stopped as 15 meters of roadbed near a bridge between Nampyong and Hochon has been washed away. Operations on other train routes have also been partially shut down due to torrential rains, KORAIL said. Residents in low-altitude areas should take precautions against high waves, landslides and strong winds, the agency said. The Central Disaster and Safety Countermeasures Headquarters ordered 21 passenger boats to remain docked in Mokpo and Wando and closed nearby mountains to visitors. Some 21,000 fishing boats are also docked at ports in southern areas, the disaster center said. Here is the radar image of the eye approaching Jeju Island. 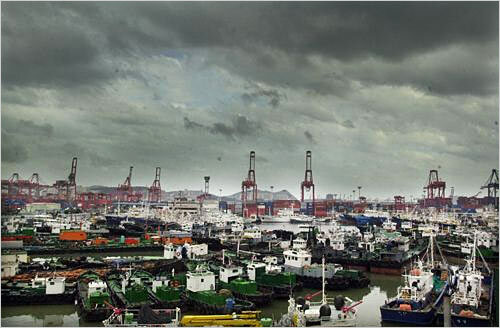 While ships come in flocks escaping from Typhoon Megi into Pusan harbor on Wednesday, dark clouds cover the sky. As Typhoon Megi proceeds northward towards Seogwipo, Jeju island, a giant wave batters a port in Beophwan-dong, Seogwipo. The eye is now northeast of Pusan, and the storm is heading to Hokkaido in Northern Japan. At least six people were killed and two others were missing in Shikoku on Wednesday as Typhoon Megi drenched a wide swath of the country with heavy rain, according to local rescue and police officials. A house in Onohara, Kagawa Prefecture, is flooded after Typhoon Megi swamped western Japan with heavy rain. Megi, the season's 15th typhoon, was moving north over the sea southwest of Kyushu late Wednesday evening, the Meteorological Agency said. The agency warned of more heavy rain, strong winds and rough seas in the Kyushu region and elsewhere in southwestern and western Japan through Thursday. The deaths and disappearances all took place in Kagawa and Ehime prefectures, where around 850 houses and apartments have been flooded. On Wednesday morning, the body of Kirie Shinohara, 75, who worked at a local human resource center for senior citizens, was found in the port of Kannonji, Kagawa Prefecture. She was believed to have fallen into an irrigation duct in the city Tuesday night. Rescuers also discovered the body of Masanori Takao, 84, of the town of Kotohira in the prefecture in the Seto Inland Sea off the city of Sakaide. He, too, had fallen into an irrigation duct. On Tuesday night, farmer Masakatsu Kuroda, 74, of the town of Toyohama in the prefecture was found dead in an irrigation ditch near his home. The body of Mitsuo Kaji, 78, of Shikoku-Chuo, Ehime Prefecture, was also found in an irrigation channel in the city. On Wednesday afternoon, the body of a man believed to be Terumi Tanaka, 70, was found buried in mud in his house in Niihama, Ehime Prefecture. 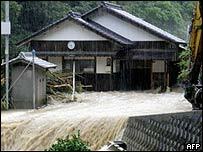 Tanaka's house was hit by a landslide caused by the massive rain. Also in Niihama, Takashi Imai, 73, and his wife, Michiko, 73, were buried in a landslide at the back of their house. Imai was pronounced dead after being taken to a hospital. His wife was listed in a serious condition. A flood also washed two people from a shelter in the town of Onohara, Kagawa Prefecture, Tuesday. They remain missing. Megi, which means fish in Korean, was 360 km southwest of Fukue Island in Nagasaki Prefecture as of 7 p.m., moving north-northeast at 20 kph toward the Korea Strait. The typhoon had an atmospheric pressure of 970 hectopascals and packed winds of 126 kph near its center. Some areas from northeast to western Japan saw as much as 30 mm of rain in one hour Wednesday due to the warm, wet air that the typhoon fed to a front, according to the weather agency. It added that the rain was expected to intensify. Shikoku-Chuo, Ehime Prefecture, recorded 533 mm of rainfall since midnight Tuesday, while the village of Nango in Miyazaki Prefecture saw 410 mm. More than 2,400 people have been evacuated as Typhoon Megi lashes the southern shores of South Korea. Heavy rains and high-speed winds have forced the cancellation of dozens of domestic flights, the government's news agency reports. The storm is heading north-east and off the eastern coast of Cheju Island and is expected to strike the port city of Pusan on Thursday, officials said. Typhoon Megi has already swept through Japan, leaving at least seven dead. Several ferries and train services in South Korea have also been suspended, as meteorologists reported winds of 130km/h (80 mph). The authorities have evacuated hundreds of people in the southern cities of Naju and Changheung and put hundreds more on alert for possible landslides, reports say. Some low-lying areas are already flooded, South Korea's Yonhap news agency reported. "So far we have some houses and rice paddies under water in the southern region," an official from the Central Disaster and Safety Countermeasure Headquarters said. The Korean meteorological agency confirmed that Megi - which means catfish in Korean - was expected to move into the Sea of Japan after skirting the southern part of the peninsula. Typhoons hit the peninsula each summer, and last year's typhoon Maemi, the strongest to hit the country in a century, killed at least 85. Most of those killed by Typhoon Megi in Japan died in floods and mudslides, while two others were swept out to sea some 500km (310 miles) west of Tokyo. Wow...those irrigation ducts are a killer, huh?? Hey...do you or anyone know whether or not they have mass evacuations just like we do? More than 2,400 people have been left homeless after Typhoon Megi lashed the southern shores of South Korea. Five people are dead or missing after heavy rains and high-speed winds which forced the cancellation of dozens of domestic flights. Typhoon Megi has already swept through Japan, leaving at least nine dead. The storm is heading north-east and is expected to bring further heavy rain to northern Japan, which was hit by floods last month that killed 15 people. Residents in Gwangju and other south-western towns were evacuated, as meteorologists reported winds of 130km/h (80mph) from Typhoon Megi, which means catfish in Korean. The typhoon has now weakened, although is still powerful enough to bring heavy rain to the eastern regions as it moves across the country, weather officials said. Shikoku and the nearby Tsushima islands were particularly hard hit. Some 205mm (8in) of rain had fallen on some areas of Shikoku by 0900 (2400GMT) on Thursday. Typhoons hit the region each summer, and last year's Typhoon Maemi, the strongest to hit South Korea in a century, killed at least 85 people. At least eight people are presumed dead or missing and over 2,600 residents have been evacuated from their homes due to heavy rains brought by Typhoon Megi, a state-run disaster control center said Thursday. The typhoon, which severely affected the southern part of the peninsula from Tuesday, detoured toward northern Japan around 3 p.m. after passing through southern and eastern coastal areas. The Central Disaster and Safety Countermeasures Headquarters said three people had drowned and two others were swept away by flooding in North and South Cholla provinces. About 1,260 homes in South Cholla Province and Kwangju were inundated with flash floods Wednesday night. Waters in the areas engulfed some 8,158 hectares of farmlands, while wind gusts cut off electricity and disrupted transportation in some southern areas, the disaster center said. In Imsil, North Cholla Province, a 70-year-old farmer was found dead in a stream. A 65-year-old woman in Sunchang, South Cholla Province and a 65-year-old man in Pohang, North Kyongsang Province, also drowned in rivers in the area. Police suspect they fell into the swollen waters by mistake. In Kwangju, 700 residents were evacuated from their town Wednesday night as the bank of a nearby reservoir showed signs of collapsing. They were able to return to their homes after soldiers redirected the water. 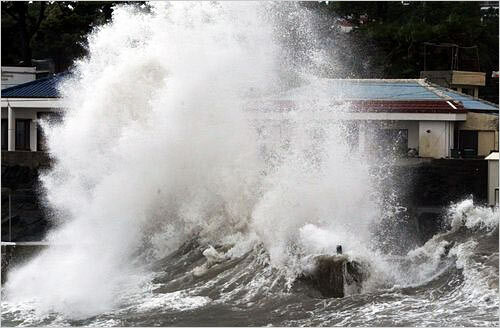 In Cheju Island, sea banks were washed away in several coastal towns and fishery facilities were destroyed or swept away by large waves. Over 100 flights between Seoul and southern regions had been canceled since Wednesday, but most of the canceled routes resumed operations on Thursday afternoon according to the Korea Airports Corporation. Parts of railroads in the Cholla area and railways between Kangnung in Kangwon Province and North Kyongsang Province were blocked due to landslides, the Korean National Railway said. Naju in South Cholla Province had the largest amount of rainfall with 458 millimeters, while Wando Island received 377 mm as of Thursday. Sanchong in South Kyongsang Province recorded 328 mm of rain, Wonju 211 mm and Sokcho 322 mm, according to the disaster agency. A weather agency forecast one or two more typhoons would hit the nation by the end of September. SEOUL (AFP) - Typhoon Megi ploughed through South Korea's southern provinces, causing flash floods that left eight people dead or missing, disaster officials said. Heavy rain brought by the typhoon left 2,400 people homeless in southern coastal regions, the national anti-disaster agency said Thursday. Flash floods washed away and killed a 65-year-old woman in Soonchang, 260 kilometers (156 miles) south of Seoul, and another man in nearby Namwon, it said. Three people in South Jeolla province were missing, while a landslide injured a farmer in South Gyeongsang province, the agency said. Megi, which killed nine people in Japan, left the east coast after dumping up to 92 millimeters (nearly four inches) of rain per hour, weathermen said. Typhoon Megi's death toll climbed to nine in western Japan as two more bodies were found in Kagawa Prefecture on Thursday morning. Elementary school pupils disembark from a helicopter Thursday in the town of Tosa, Kochi Prefecture, after being rescued from a nature education center in the village of Okawa in the prefecture. The Meteorological Agency forecast the season's 15th typhoon will hit the northern part of the country -- either the Sea of Japan coast of the Tohoku region or southwestern Hokkaido -- early Friday, bringing more heavy rain, strong winds, rough seas and mudslides. The discovery of the bodies of Toshie Saeki, 72, and her daughter-in-law, Kayoko, 45, in Onohara, Kagawa Prefecture, brings the number of deaths to nine in Kagawa and Ehime prefectures. The two had been missing since Tuesday evening, when they were believed to have been swept away in a flooded river. More than 600 people have evacuated from their homes in Onohara, Kagawa Prefecture, and Shikoku-Chuo, Ehime Prefecture, due to landslide fears. Authorities rescued about 130 elementary school children and about 20 adults accompanying them, who had been stranded since Tuesday at a lodge in the village of Okawa, Kochi Prefecture. They were unable to leave the nature education center when mudslides blocked the roads. Power and phone lines then went down Wednesday. One of the children showed suspected symptoms of appendicitis, so a disaster relief helicopter airlifted the girl to a nearby hospital around 1 p.m. Thursday. Doctors who treated the girl later at a hospital in Kochi said she did not suffer the ailment. As weather improved later in the afternoon, authorities managed to rescue all the other schoolchildren from the facility by 5 p.m. Thursday. The children were later reunited with their parents in the neighboring town of Tosa for the first time in three days. Afterward, authorities were able to bring the adults out. Megi also has ravaged the Tsushima Islands between the Korean Peninsula and Kyushu, and has brushed the southern tip of South Korea. The powerful typhoon was moving northeast at 55 kph over the Sea of Japan Thursday afternoon. As of 3 p.m., it was located 180 km north-northwest of Saigo, Shimane Prefecture. It had an atmospheric pressure of 970 hectopascals and packed winds of 126 kph near its center. Heavy rain centering on the Pacific coastal areas of Kyushu and Shikoku was expected to spread to the Kinki and Tokai regions with up to 60 mm falling in one hour. In the 24-hour period until noon Friday, the Pacific coastal region of Shikoku and the central and southern Kinki region were expected to get up to 200 mm of rain, the Tokai and Koshin regions up to 150 mm, and Tohoku and Hokkaido up to 200 mm. Meanwhile, other parts of the country, including the Hokuriku and Kanto-Koshinentsu regions, saw the mercury rise from an apparent foehn phenomenon -- caused by differences in air pressure that causes a warm dry wind to blow down from the mountains. The mercury hit 34.9 in Tokyo. The tropical typhoon Megi, that wreaked havoc in southern Japan and South Korea, killing 13 people in three days, has hit northern Japan's Honshu island. The storm has caused landslides and floods and has led to the electricity for 130,000 homes being cut. It has emptied 47mm (1.8in) of rain over some areas in an hour and created 149km/h (91mph) gusts of wind. Megi, whose name means catfish in Korean, has now crossed the island and is heading out across the Pacific. The latest fatality from the storm occurred when a man was struck by a flying advertising hoarding. Glass from broken windows has caused a number of other injuries. Some 700 people have been evacuated from their homes due to heavy rains, and 24 flights were cancelled. Separately, a group of around 165 primary school students who were stranded in western Japan by a landslide have been rescued by helicopter. Most of the 10 people killed by Typhoon Megi in Japan died in floods and mudslides, while two others were swept out to sea some 500km (310 miles) west of Tokyo. More than 2,400 people were left homeless after Typhoon Megi lashed the southern shores of South Korea on Thursday.